spring, birds build their nests and hatch their eggs. Like watching the waves come in, or drawing a circle, the nest also represents a recurring cycle and is calming and meditative. On a visual level, the intricacy of the structure of the nest is like calligraphy on the canvas. The textures, lines and marks of the nest are intriguing. Because of my love of textures, I am drawn to nests, as well as thickets, leafless branches, empty trees. I have used digital images of nests or hand painted them. Also, isn't there something wondrous about the aesthetic perfection of bird eggs? They are fragile, yet a powerful statement for the cycle of life. When you think about it, every animal begins life as an egg. Is there an image that shows up in your work over and over? Great blog! I love this post! Amazing your banner! Thank you for your visit on my blog. sent back to life as a bird..."
This is a wonderful line. 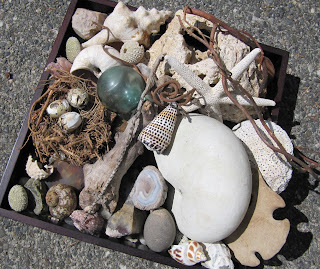 Your collection of sea things is lovely. Of course my eye went straight to the glass float! Donna, you always inspire me – the vignettes you show us with your found objects, the books you find, the thinking behind your work, the end result – all are so interesting and pleasing to my eye. The link to Joyce Hill is a fun one too! So now, I’m dashing to the studio before I go to work. How could I resist? I am so glad you started a blog! Very inspiring Donna! I love all of these and am becoming more of a fan with each post. I love that you give us a transition, from poem -- to images -- to your work. It's always interesting to see how each artist moves through the process. If there is one image that always seems to crop up -- an horizon line, some kind of demarcation between earth and sky, an orientation point? Oh glorious images, every one! Your art speaks to me. I can see why. All the things I love. Art and photography that are beautiful to the eye and words that make me ponder. Great post!! I am so glad you visited me on my blog so I got the chance to visit yours Donna.....I LOVE your art oh so much. Such a poetic life you seem lead..beautiful blog, header, your images and words...so full of wonder and beauty...I am going to add you on my 'creative types' list (blogroll) so it'll be easy to visit you again. Oh and when I look at the list of artists you admire..I see my favorites too...especially the first three...how about Robert Rauschenberg? What you wrote is so thoughtful, quietly wonderful. 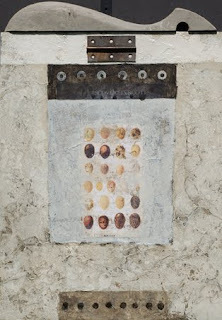 Of course I should add Robert Rauschenberg to my list--- I have several of his books of work. He was one of the original 'add everything under the sun' to his work. Donna, this post has so many layers and to quote the poem..."intricate pleasures!" I too love found nests and the fragile shells left behind. I so like your question and for me different images appear in my work at different times...circles, a curvey line known only to me. Thank you for such a thoughtful post. Birds are out during the day mostly and fly and sing mostly and partly. Love your blog! Inspiring images and words. Nests keep coming up for me lately and I just purchased some sandblasted glass eggs yesterday. They would fit nicely into your visual nests. 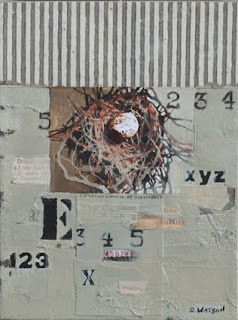 I have a few encaustic paintings that feature nests too - You can see one on my flicker page: http://www.flickr.com/photos/aliciatormey/3106374396/ if you are interested. Thank you for commenting on my blog! Wow. I've just arrived at your blog and am finding all the natural materials that inspire you very inspiring indeed, not to mention your beautiful artwork! And I love this poem. 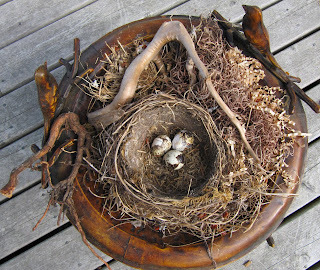 I have a collection of nests, and began my blog with an image of one. Thanks for stopping by Secret Notebooks, very nice to "meet" you!